Club Penguin Cheats by Mimo777 Club Penguin Cheats by Mimo777: Club Penguin Reviewed by You & Rockhopper News! "My favorite card is the card with G's boom box on it. 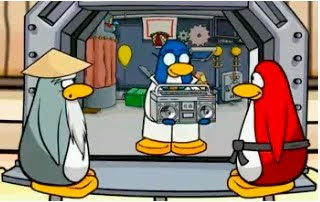 It's so funny when your penguin starts dancing, and then before he can find out what's happening the boom box explodes!" Coins for Change and Rockhopper will be returning for Christmas, so, next week, Club Penguin wants to know what you like best when Rockhopper visits. If Club Penguin chooses your review, you will get 10,000 coins. Sweet! Let me know what you are looking forward to when Rockhopper comes to town. Coins for change is great! Its almost been a year since ive been on club penguin! 1. When people ask questions in the comments, answer them correctly. 2. Be nice to people, keep your answers short. 3. When you answer a question, you put your penguin name with CPG MOD next to it. 5. You can become a MOD, SUPER MOD, LEGENDARY MOD, MIMO MOD, or even a MEGA MIMO MOD! 6. The better, faster, longer you're a mod, the faster you'll move up. 7. Other ways to move up your Mod status is to congratulate Contest winner and new Mods. 8. When you become a MIMO MOD, Mimo will secretly meet you, and add you on Club Penguin! 9. When you stop answering questions or be rude, you'll be removed from the Mod list. 10. Spread goodness and joy around Mimo and the gang! Club Penguin is doing something weird because everything is coming out a day early! Kkkkkkk, ya we r still 'sisters'. I'm looking forward to possibly meeting RH. Uhhh....I think I ate too much pie. Thank You SO much for the tips Marquizi98 (CPG MOD). I will work real hard to become a Mimo mod. I hope I can make it! Hey Mimo, Zxz's comic came out in the Newspaper for the second time! Check it out! He is my best friend, so I would like to congratulate Zxz for getting his comic in the newspaper for the second time! hey mimo, do u know the secret agent code? well ive just realized that in the ninja hydout flying flippers emporiom where the place in the center with the 3 elements. Well outlining that is a codezzzzzz/ Whats it sayin? Has anyone else noticed that everything on Club Penguin is coming out a day early? Card Jitsu-fire, the newspaper... I wonder if CP is doing something so big and awesome it's warping the events? Awweeessoooommmeeee! My fav is the and with the dojo and the big eraser and draws a funny face on u! and the n erases u! To be a mod u have to help somebody. Hope I helped. Hi the new selds are the best!!! sometimes if ur lucky you go over a log without snow there and you go faster on ice then others! Thanks everybody for all the tips. It makes me happy!! Cool, so many helpful mods these days. First copy someone's question and then paste it and answer it, leave you're name plus (CPG Mod) then if you do it frequently you will be noticed. If you need more details which you might look at the mod rules on top of the mod list near the bottom of the right side posts and there will be a link. Ya it is. Well I mean for the day early thing. I don't know if it's coming out with something awsome, maybe a new mission. I really hope it's NOT a member only thing. Cp this year has gone waaaay to far. Hey mimo ive been wanting to be a CPG MOD so much. Can I try it? Hey mimo i totally agree with you your not crazy that language bar is driving me nuts! Everytime I try to click play now it turns club penguin spanish and brings me to another page i have to go back navigate my way around it and it takes forever! please move this club penguin!! thank you waddle on!!!!!!!! i've got a great card where you have a jet pack and fly around your opponent it's funny.I've also got this great card where you are in the sea and u are surfing it's funny.